The World Health Organization says a person's daily sugar intake should be just 5 percent of their total calories — half of what the agency previously recommended, according to new draft guidelines published on March 5, 2014. . After a review of about 9,000 studies, WHO’s expert panel says dropping sugar intake to that level will combat obesity and cavities. That includes sugars added to foods and those present in honey, syrups and fruit juices, but not those occurring naturally in fruits. When WHO last revised its guidelines more than a decade ago, it recommended sugar should be less than 10 percent of daily calories. 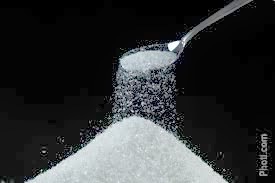 The U.S. sugar industry was so incensed it lobbied Congress to threaten to withdraw millions of dollars in funding to WHO. A contentious reference to the sugar limit was removed from a global diet strategy, but the recommendation passed.“The less sugar you’re eating, the better,” said Dr. Robert Lustig, a professor of pediatrics at the University of California and author of a book about the dangers of sugar. Lustig said WHO’s new guidelines could alter the food environment by forcing manufacturers to rethink how they’re using sugar in processed foods like bread, soups, pasta sauces and even salad dressings. The objective of WHO’s guideline is to provide recommendations on the consumption of free sugars to reduce the risk of non-communicable diseases (NCDs) in adults and children, with a particular focus on the prevention and control of weight gain and dental caries. When finalized, the recommendations in this guideline can be used by program managers and policy planners to assess current intake of free sugars relative to a benchmark and develop measures to decrease intake of free sugars, where necessary, through public health interventions.